COCOA BEACH, Florida -- A man was struck by lightning on the beach in front of the DoubleTree by Hilton Cocoa Beach Oceanfront hotel, located at 2080 North Atlantic Avenue in Cocoa Beach, Florida, shortly before 4 p.m. today. A DoubleTree employee, Matt Smith, was also on the beach wrapping up the rainy day while stacking beach chairs on the beach in front of the hotel. "All I heard was a boom and turned around and saw him laying there," Smith said. "I ran back to the hotel, called 9-1-1 and a medic who was at the hotel came back out with me to where the man was lying." 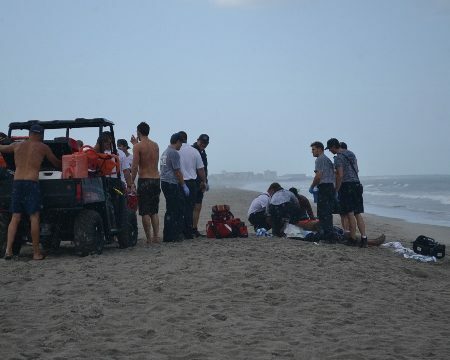 Cocoa Beach Fire Rescue Crews along with Brevard County Ocean Rescue lifeguards responded to the scene. The man was transported by Brevard County Fire Rescue 61 to Cape Canaveral Hospital.